Note: In the following joint review, Henning and Eddie provide their opinions on the film, with Jason writing up the Video, Audio, Extras, and Parting Thoughts. First, I have to send a special thanks to Tom Hanks and HBO. They worked together to create 2 of the best miniseries ever made, at least in my opinion. The first was “From the Earth to the Moon”, which covered American attempts to match the Soviets in the space race. The second masterpiece–one with the collaboration of Steven Spielberg and famed historian Stephen Ambrose–is “Band of Brothers”. “Band of Brothers” chronicles the travails of the men of Easy Company during World War II, from basic training and the D-Day invasion to their capture of Hitler´s “Eagle´s Nest” towards the end of the war in 1945. The series has 10 episodes running approximately 50 minutes each. HBO´s DVD box set contains 6 discs, with 2 episodes per disc and the sixth DVD devoted exclusively to bonus materials. The series won a Golden Globe for Best Miniseries or Movie Made for Television. I heartily agree. Being the history nut that I am, I once committed to memory all the maps pertinent to Europe between 1900 and 1990. I could draw–without looking at a book–shifting boundaries as various countries grew, shrunk, appeared, or disappeared. It goes without saying, then, that I consider the European Theatre during World War II to be the most dynamic, intellectually stimulating period of the 20th Century. Like most men, I entertain a strong predilection for war movies. My favorite war movies happen to be set in Europe between 1939 and 1945. Since Steven Spielberg is my favorite filmmaker, it comes as no surprise to anyone that my favorite WWII movie for the past few years has been “Saving Private Ryan”. Poignantly, each episode of “Band of Brothers” begins with videotaped remembrances by actual members of Easy Company. From what I understand, each part was cast so that the actors would physically resemble the real soldiers. The miniseries is based on the nonfiction book “Band of Brothers” by Stephen Ambrose. (Sadly, Mr. Ambrose passed away very recently.) The miniseries/book details the experiences of Easy Company, a combat group that saw most of the heaviest fighting on the Western European Front. It sustained the most losses, and it also became legendary. The expression “band of brothers” comes from William Shakespeare´s “Henry V”. The young Harry, in order to rally his troops, delivers an impassioned speech (“We few, we happy few…”) about the brotherhood of men who shed blood together. The eloquence of Shakespeare´s soliloquy has been captured by the visuals of “Band of Brothers”. More than once, I broke down in tears as I watched all 10 episodes of “Band of Brothers” in one sitting. I cried for the young men whose spirits were shattered. I cried in gratitude for not ever having to participate in armed combat. I cried when I finally grasped what it meant to entrust completely one´s life in the professionalism of the man standing next to him. Even though it was made for television audiences, in many ways, “Band of Brothers” is much more graphic than “Saving Private Ryan”. The carnage lasts for more than 10 hours, not just 3. The series shows how there are more ways of getting maimed than you thought possible. There´s even a shot of a German soldier being crushed by the treads of one of his own retreating tanks. It´s true that these images are too disturbing to show to easily-troubled children. However, in refusing to flinch in the face of reality, the filmmakers have paid their utmost respects to a generation of heroes who fought for the very existence of the free world. In addition to the Golden Globe from the Hollywood Foreign Press Association, the miniseries also received a host of accolades from various trade guilds as well as 6 Emmys, including Outstanding Miniseries (it was nominated for a total of 19 Emmys). “Band of Brothers” richly deserved to win all of its awards, but its cast also deserves high praise. David Schwimmer bites viciously into the role of Herbert Sobel, a tough officer hated by everyone in Easy Company; his aggressive (though not entirely necessary) training regimen is what ultimately makes the men of Easy Company what they are. 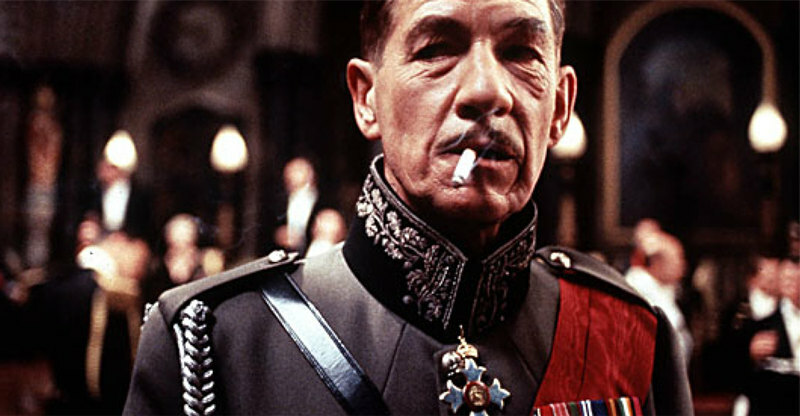 Damian Lewis carries most of the show as Richard Winters, a noble leader who inspires the best in his men. (You can see how Tom Hanks´s Captain Miller in “Saving Private Ryan” was based in large part on Winters.) Donnie Wahlberg (yes, formerly of New Kids on the Block), Ron Livingston, and Neal McDonough (most recently seen on the big screen as Tom Cruise´s second-in-command in “Minority Report”) all make great impressions. Like “Minority Report”, “Band of Brothers” displays filmmaking of the highest order. I subscribe to the theory that geniuses and madmen are the same, the difference between the 2 groups being that one benefits society while the other doesn´t. (This is partially confirmed by the psychological profiling of astronauts, who have incredibly similar brain activity, brain waves, and psychological tendencies as serial killers–basically, you have to be crazy enough to want to go into the void of deep space.) The genius of the skill used to make “Band of Brothers” lies in the overwhelming degree of fury present in each frame. Hand-held cameras approximate the movement of soldiers trying to make themselves as small of targets as possible. Jarring editing techniques disorient viewers the way soldiers would be in real combat. The expert sound design ensures that viewers will know what kinds of guns are being fired as opposed to the indistinct thuds of generic action movies. The seriousness of purpose is spectacular. I´m very enthusiastic about the miniseries, but I do have a complaint about “Band of Brothers”–I don´t like the title for Part 9, which is “Why We Fight”. That particular episode deals with the discovery of concentration camps by Allied infantry. While the Allies knew about the existence of death camps, they weren´t exactly fighting the Axis Powers to free Jews, gypsies, and other victims of the Nazis´ annihilatory policies. Therefore, for me, the phrase “Why We Fight” rings propagandistically false. The “Chicago Sun-Times” declared “Band of Brothers” to be “the best miniseries in the history of television”. It is also the most profound war film ever made, surpassing even Spielberg´s own “Saving Private Ryan”. Not too long ago, I wrote that “Grave of the Fireflies” convinced me that war should be avoided at all costs. “Band of Brothers” reminded me that sometimes, the good war must be fought, plain and simple. “Band of Brothers” is presented in its original 1.78:1 aspect ratio. Much has been made online about the intentionally washed out, grainy look to all ten episodes, specifically regarding the fear Warner Brothers applied DNR to “clean up” the miniseries. Here’s what I can report: grain is largely intact throughout each and every disc. Now, about that grain. The first time I really noticed it was gone happened to be in Episode 8, “The Last Patrol.” Everything on screen looks too clean considering what comes before and after. Am I saying DNR was absolutely applied here? No. Just that there is a different look to the action. Take that are you will. Chances are most audiences aren’t going to notice and the use of DNR is so minuscule the score will reflect it. There is one other issue I wanted to mention. In the same episode, the slats on a wooden fence appear to jump as the camera moves into a forest. At no other time does this jumping become a problem, leading me to believe this is an isolated incident. The desaturated and blown out look of “Brothers” is well rendered in high def, with the transfer doing a bang up job from beginning to end. There are no problems in dark scenes with details or blockiness while snow covered locations remain crisp. By design, there are no colors to “pop” on the screen, leading to a naturalistic, dirty presentation just as was originally intended. HBO provides one heck of a DTS-Master Audio 5.1 English soundtrack to compliment the video specs. Just about the only thing I can against it is the extras are not presented in the same format. From the very first episode to the closing credits of the last, “Band of Brothers” is clear reference quality material. Dialogue, as expected, is clear and distortion free while any number of sound effects compliment the action. It seems like cliché to mention listening to any given episode makes the audience feel like we were on the set during filming, but that’s exactly what the track manages to do. Of particular note is the entire “Bastogne” segment, with any number of military boots trampling over snow from all directions. Directional effects seemingly come out of nowhere as voices shoot across the sound field and various vehicles come to a stop on either the right or left side of the screen. Voices tend to sound a bit lower than they should; however, it’s a symptom of Michael Kamen’s score and the ambient noises being that much more up front. I’ll even admit I jumped once or twice when an unexpected mortar round flew in from the side speakers. French and Spanish 2.0 tracks are also included, as well as English, French, Spanish, Brazilian and Portuguese subtitles. HBO has either ported over or repurposed just about every extra from the 2002 DVD set all the way down to the metal packaging and cardboard fold out disc holder. Each disc contains two episodes (the sixth disc holds most of the extras). For every episode, HBO provides a short summary along with the trailers for the entire series as standalone options or under a play all. Additionally, the “Field Guide” feature has been broken down into “In the Field with the Men of Easy Company.” Once enabled, a timeline shows up on the bottom of the screen with various markers giving specific information about the scene. It can range from archival footage to information on the men and an explanation of the terms used by the characters. Keep a finger on the remote since this information doesn’t pop up automatically; you need to press enter on the remote as each marker is illuminated. It is possible to manually move from marker to marker using the right arrow key. Also attached to each episode is a picture in picture commentary track. Again, HBO appears to have used the existing eleven-minute soldier video guide to populate this feature. I have no qualms with it. In fact, it’s something of a small thrill to see the members of the real Easy Company talking about their experiences as the film runs. Both of these features are BD exclusives. “In the Words of Easy Company” requires Bonus View capability (aka Profile 1.1). “We Stand Alone Together: The Men of Easy Company” is the premiere feature on the final disc. Running 77 minutes, it retreads the same territory covered by the miniseries, only in a much abbreviated fashion. Interview snippets are intercut with archival footage to form the narrative. The “Making of Band of Brothers” 30-minute featurette follows, providing more insight into the creation and filming of all ten episodes than we normally find in anything labeled a “featurette.” A very short segment on the premiere in Normandy rounds out the special features. “Band of Brothers” subplanted “Roots” or “North and South” as the miniseries to end all miniseries. With scope, a literal cast of thousands, dynamic production values and its heart in the right place, this set needs to be on every high def shelf.